As a resident of Almonte since 2002, Noxon has grown increasingly aware of the importance of the river to the community — its residents, businesses, the larger community — and as an integral component of the natural world encompassing it. 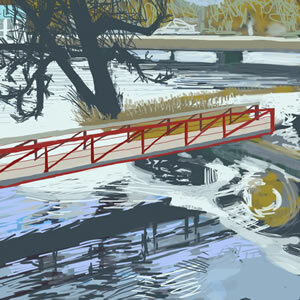 Noxon painted her riverscapes on her iPad with a conductive brush and her fingertips, without a preconceived idea of the finished work, “relying on her visual vocabulary of organic forms, texture, negative space and colour.” The amazing results of her exploration are titled “Almonte’s Mississippi: Points of View,” and her prints remain on display throughout January at General fine craft, art & design at 63 Mill Street in Almonte. She was born in Toronto and excelled in the arts and sports during high school in Don Mills. After working in Banff for a year on a ski hill, she studied graphic design for a year in Toronto and then returned to the West. 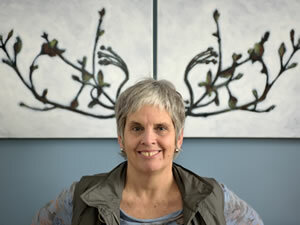 She completed a three-year diploma in Fine Arts at what is now the Kootenay School of the Arts in Nelson, B.C. After working for a couple of years as an art installer and a painter of theatre sets, Jennifer returned to school for a B.Ed. at Concordia University in Montreal. Noxon claims she developed her sense of humour after graduation while teaching English as a Second Language (ESL) in Japan for a year. Her coping technique was to laugh at everything she didn’t understand. For twenty-five years she has enjoyed “the best job in the world” — teaching ESL and literacy, and training volunteers to work with immigrants who were homebound. The combination of doing something productive that required lots of creativity suited her perfectly. After winning a songwriting competition in 1997, Jennifer performed at festivals, coffee houses and house concerts in Ontario, Alberta and BC. She has toured with Lynn Miles and Ian Tamblyn, and shared stages with Dar Williams, Garnet Rogers and Stephen Fearing. In 2004 she joined with Ottawa-area songwriters Chris MacLean and Alise Marlane to become Frida’s Brow. In 2006 their début eponymous album was nominated for a Canadian Folk Music Award. Over time Noxon realized that she wasn’t cut out to be a travelling solo musician and she gradually shifted gears to focus on painting. Her move to Almonte was a powerful stimulant. Nature has always been her “best teacher and primary source of inspiration.” Paddling on the Mississippi River and wandering along its banks and over Almonte’s multiple bridges led her to discover and celebrate the extent to which the river is at the heart of the town’s character. With her river series of paintings still in progress, Noxon has been exploring new routes to satisfying the demands of both her introverted and extroverted selves. She has just returned from a Community Choir Leadership Training Course in Victoria, B.C., and is planning the launch of the Rhythm & Song Community Choir in January. As part of the Ubunto Choirs Network, the Almonte-based choir will be inclusive, non-auditioned, community-focused and socially engaged. No formal music training is required. If you are curious about this fun, stress-free new Community Choir, contact Jennifer Noxon. In preparation for her new directorial adventure, Jennifer is rehearsing a “pop-up” choir for its first public appearance during the “Live from Mississippi Mills – It’s Saturday Night” variety show on Saturday, January 16, 2016 at 7:30. The choir plans to pop up at the Almonte Old Town Hall, harmoniously located within sight of the Mississippi River at 14 Bridge Street. Come check it out.